thank you for your business and we look forward to serving you. We are large enough to serve your needs, small enough to care. We are competitively priced, while being Customer Service Driven. We are proud to have our facilities powered by solar energy. JB Moving Services Inc. is a full service moving company providing residential, commercial and International relocations, containerized storage as well as self storage. We also provide long and short term containerized storage of household or commercial casegoods. 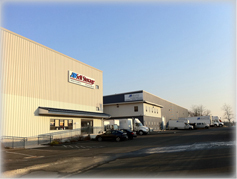 Our most recent additions are our Records retention division and JB Self Storage. With office space at a premium, this may be a viable alternative allowing records and inactive files to be stored inexpensively in a safe and secure environment. At JB Moving, your needs become our needs, your transition becomes our transition. To this end, we ensure that all of the logistics involved are painstakingly planned to the last detail. This ensures that the proper resources are available at every stage of your relocation. We realize that every client is different and unique in many years. Our task is to understand your specific needs and requirements and address them in the most cost effective, efficient way possible. Experience and Customer Service – these are the two items that make JB Moving services unique to an industry where the customer is too often overlooked. The people who make up JB Moving Services are our driving force – but the back bone of our success is our genuine cohesiveness as a team. We’re all proud to be a part of this moving company, JB Moving Services Inc.
As individual as our multifarious talents may be, we maximize our full expertise by combining our efforts in the pursuit of excellence. Our front office keeps JB Moving Services running efficiently, which in turn enables the rest of us to deliver the excellence and quality our clients have come to expect. To learn more about our office, please click on one of the names to the right.